That’s the word from Porirua City Councillor Dale Williams who says this is the new norm and that young people are not the problem, but the solution to a shortage of suitable candidates for local jobs as Porirua City continues to boom. 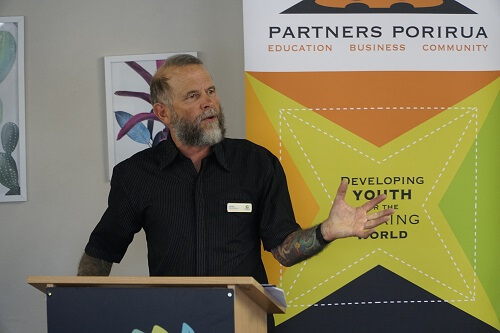 Cr Williams was addressing local businesses as he celebrated the success of the Porirua Youth 2 Work Movement. As Chair of the Youth 2 Work advisory board Cr Williams says that our aging population is putting us in a position where there will soon be more vacancies than candidates and that it’s imperative that our young people leave school ready for work. “We know our employers need staff and we know our young people want to work – we’re here to help bridge the gap and make it happen. Cr Williams says all of us have that responsibility, including the Youth 2 Work Movement which has now placed more than 200 local young people into employment over the past few years. Youth 2 Work helps young people get job-ready through a variety of activities including JOBfest, the Youth Ambassador programmes, driving training, community mentoring and careers workshops. SARNZ is the industry body for scaffolding, access and rigging in New Zealand. General Manager Jessica Pritchard says partnering with Youth 2 Work is a good fit for the organisation that recently introduced apprenticeships. “We’re big on earning as you learn and want young people to identify our industry as a great career opportunity. They can earn as they learn and keep fit at the same time.” She says the industry has a culture of team work and inclusiveness and is the perfect environment for young people to start out in. Danny Mareko, Manager Communities and Participation, says the service was already doing a lot with young people, so it made sense to become a Youth 2 Work partner. The organisation actively recruits young people and has a particular focus on trying to get more men into the sector. “We run a programme called ‘Y Men’. It’s aimed at Māori and Pacific men (but not exclusively) and is responding to the situation we find in society where there are a lot of families that don’t have any males in their lives, there’s a lot of children with no positive male influences, and we’re working to address this. Unite Recruit specialises in civil, industrial and commercial recruitment. Adrian Lebita, Office Manager says there can be lots of barriers for young people when going for jobs. Cr Williams says partnering with local businesses is the key to success for the Youth 2 Work Movement. 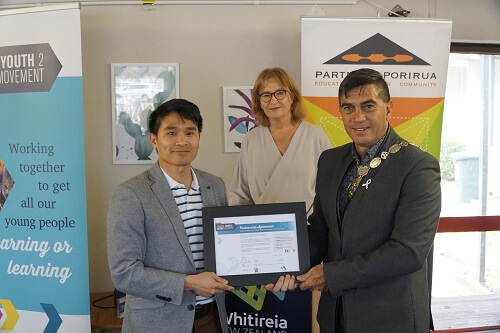 Porirua Mayor Mike Tana and Partners Porirua Executive Director Michelle Robinson welcome Adrian Lebita from Unite Recruit as a new partner to the Porirua Youth 2 Work Movement.